Much of the inflation debate is focused on the intensity of price pressures in the Indian economy. The length of the current inflationary episode is also a cause for worry. India has already had 20 consecutive months of inflation in excess of 8%, from January 2010 to August 2011 (the latest month for which data is available). 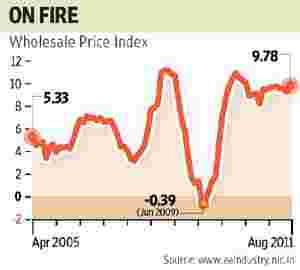 The previous inflationary episode in 2008 was more intense, with a higher peak. But it lasted for just seven consecutive months. The demand collapse after the economic crisis brought down inflation in the intervening 13 months, from December 2008 to December 2009. It is tempting to ask whether high inflation would have persisted in that period in case there had been no global economic crisis. If so, then India would have now had 40 months of high inflation in a row. It is increasingly clear that inflation is not just a result of a sudden shock, such as a rise in food prices because of inadequate rain or a jump in fuel prices because the monetary easing in the West has sent a wave of liquidity into the commodity markets. There are structural factors at play as well, which cannot be tackled with higher interest rates alone. This puts RBI in a spot, because it cannot be a spectator as inflation expectations cut loose but it also cannot deal with the underlying structural factors with its policy kit. Two trends are important here. First, some economists have begun to wonder whether the growth rate that the Indian economy can sustain without sparking off inflation is less than what many believe. J.P. Morgan economist Jahangir Aziz says that the trend gross domestic product (GDP) has fallen to between 7% and 7.5%. My fellow columnist V. Anantha Nageswaran has written in these pages that the growth ceiling for India is 8%. What this means is that any growth rate above these levels will be inflationary. Second, national rates of savings and investment have declined since 2008, thanks to the huge increase in the revenue deficit of the government and the investment inertia across the economy because of policy uncertainty. The rates of gross domestic savings and gross domestic capital formation are down by around 3 percentage points. Large companies are sitting on piles of cash. Fiscal policy is skewed towards the promotion of domestic consumption rather than investment, which adds to inflationary pressures. In an interview this week in The Economic Times, chief economic adviser Kaushik Basu argued that India does not necessarily have to keep growth down below 8% if inflation has to be brought to heel. He offered the example of South Korea during its economic boom. “From 1966 to the end of the 1970s, South Korea grew at astonishing rates, often above 10% per annum. This was also a period when it had high inflation. In fact, barring one year, it had double-digit inflation for this entire 14-year stretch. It is important to see that neither of these two trends got in the way of the other. It would have been a mistake if Korea had cut its growth back during this vital period in the belief that it was performing above capacity." The period Basu alludes to was overall a period of high inflation across the world, thanks to the spending during the Vietnam war, the two oil price shocks of the 1970s and severe droughts in many countries. Even the US had double-digit inflation in four of these 14 years. So South Korea was perhaps close to the global trend; India today has far higher inflation than the global average. That said, Basu has pointed to an important policy dilemma: should India focus more on growth rather than inflation? It may make sense in case the result is an investment boom that shifts the aggregate supply curve to the right and creates the conditions for an eventual decline in inflation. Right now, low interest rates are more likely to spur more consumption and put India on the dangerous path of double-digit inflation. But it seems increasingly likely that this debate between the growth boosters and the inflation fighters will intensify in the months ahead.